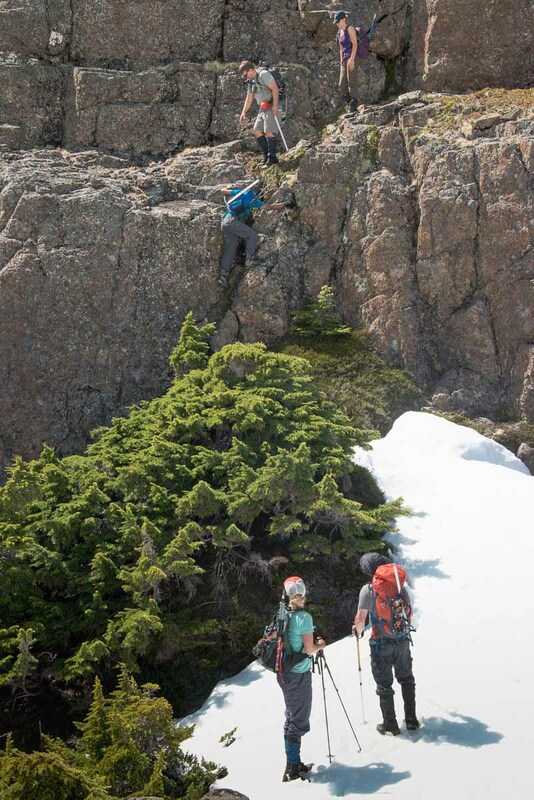 For those looking to visit a seldom summited peak, Mount Palmerston is a great trip, with only light bush. We loved the tall ridge, and the views. The scambling was rewarding. We quickly and easily climbed up the series of bumps on the ridge, on our way to reach the final summit. It may read as though everything went according to plan, but it didn’t. Great trips start with excellent planning. When Phil and I plan our trips we start with a lot of research. I’ll be honest, mostly it’s Phil doing the research. We gather GPS data, scrape the internet for hints and old route information, and watch the weekend forecast. All of this is needed to mould a successful trip. View the route and see where I took my photographs. My readers know that Phil and I are on an Island Alpine Quest: a quest to summit every peak listed in Philip Stone’s Island Alpine. This past winter we sough a number of the less-visited mountains. Scraping information on these peaks is an additional challenge. The best research often only yields a very short description, sometimes only be a paragraph in a book, and sometimes nothing at all. Regardless, our route planning usually ends with hands on paper maps, or mouse in GPS software, as we carefully examine topo maps. We select a possible route by choosing the widest spaces between topo lines and plotting it, either in Garmin Basecamp or Google Earth, then place it on a 3-D terrain model. Finally, when we decide on a workable route, we print a paper cop. This process usually provides a good idea of what to expect, but it’s far from perfect. Mount Palmerston is one of these examples. Sunday May 15th, 6 Island Mountain Ramblers gathered outside the 4×4’s on the Eve Rive Mainline. For those that read my Mount Cedarstedt report you may recall that the Palmerston road was blocked by three trees. Today we would’t be turned back! We came armed with a small chainsaw and tow cables. Our intention was to clear the road and continue on to Mount Palmerston. It took only a few simple cuts to bisect the trees which crossed Palmerston Road. I hooked my tow cables around the tree and to my hitch, then used the Jeep to move it. The Ditch Muncher effortlessly pulled the trees to the side of the road, enough to allow passage once the branches were cleared. Rick and Phil man-handled the two smaller trees. They simply pivoted the trees off the road. Within 30 minutes, we were loaded back in the vehicles and proceeding up the cross ditch riddled road. True to form, the deactivate road had dozens of cross ditches. Most are shallow, but as we approached the start of our route they became deep, car-swallowing tank traps. We parked and began hiking, less than a kilometre to the road’s end(~900m). 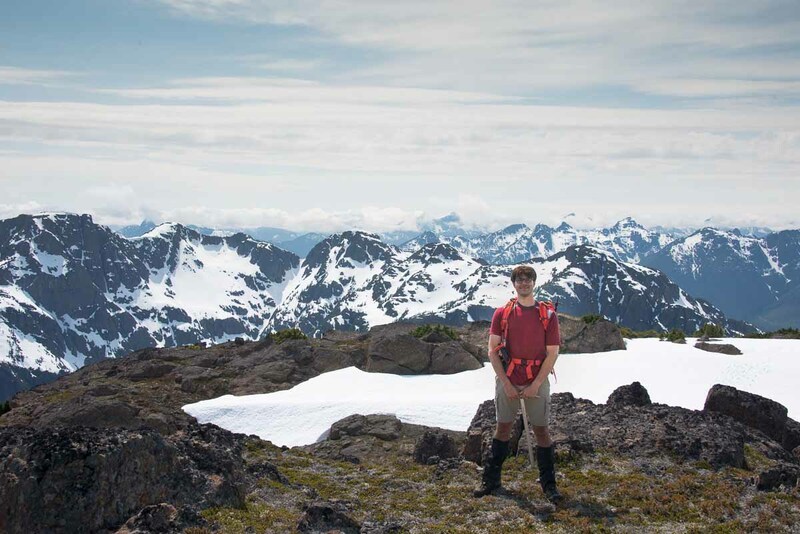 The day brought the expected Vancouver Island hiking weather –unpredictable! On the drive, we passed through dense road obscuring fog, and light rain that plastered the windows. Now, as we began our hike, the clouds raced up the slopes heading out of the valley above our heads, and favourable patches of blue appeared in the cloudy sky. It all hinted at the beautiful day we eventually received. Our planned route was to head up the logging slash into the mature forest, climb up a steep section to gain a lower plateau, cross the lower plateau and climb again to the final summit ridge. A solid plan. Of course, things didn’t go as planned. 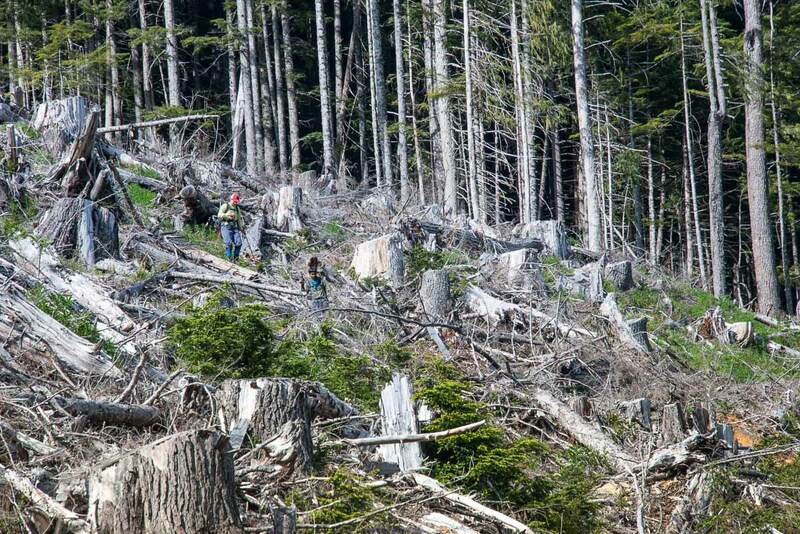 We examined our research and walked straight into a short section of logging slash. With luck we found a well-turned, easy to walk elk track through the old cutblock. It was almost pleasant to follow. We gained elevation to the mature forest quickly. What luck! the route was proving fruitful. The easy walking continued into the forest. As the slash gave way to verdant forest mosses, flowers and mature trees, I breathed in the heavy, earthy air. The breaking sun cast a persistent green-tinted light as it passed through the broad canopy above. We stepped off the elk track into the lightly covered floor of the forest, continuing northeast toward the large plateau above. The days biggest obstacle lay hidden in the forest (~1200m), a high headwall barred easy progress up to the plateau. It’s the perfect example which demonstrates that topo maps are made by someone in an airplane, and not someone on the ground. Our topos showed this to be a reasonable slope, but we were scrambling up much steeper slopes, and not making much forward movement. The light laughter heard earlier in the morning was eerily silenced, while Phil and I did some route finding. We decided to ascend left, up a gully via a lengthy process of grunting and hauling ourselves up the bush and rock. Every metre gained revealed more obstacles. Eventually, we scrambled over and around rock crenulations, and between large trees, as we followed a series of gullies up to the plateau. All the while, conversation was paralyzed –everyone focused on getting up and out of the bush. Emerging onto the sunny, snow-covered plateau (`1350), we paused to catch our breath and examine the distant summit ridge. To the east, Mount Palmerston’s crescent shaped summit ridge rises from the plateau, comprised of three bumps. We crossed the snowy plateau and ascended toward the saddle next to the northern most bump. With the easy hiking, and breath recaptured, the friendly chatter resumed. Ascending to the ridge is less about route finding and more about picking the path of least resistance. We stuck to the snow slopes, where we could easily kick steps to gain elevation quickly. When we hit the end of a slope, we forced our way through dense, stiff low-alpine fir. In the thicket we lost sight of each other. Mary and I stuck together and were the first to reach a resting spot on the saddle. The view is outstanding. All the low laying fog of the early morning was gone, and we had a 360-degree view of the straight, coast mountains, and deep into the peaks of Vancouver Island. We took a break and enjoying some snacks and water. In time, the others emerged from the bush, to the south. Phil, always adventurous, followed a route that he hoped would contour around the middle bump on the ridge. My observations from the plateau below led me to believe: Phil’s nuts! Rishi, trusted Phil and set out around the corner. Everyone else scrambled a series of easy rock ledges to the summit high above. Lisa led the way! She practically bounced up the ledges, leaving everyone in the dust. It took only a few minutes for the four us to reach the top (~1650). Phil and I reached the top simultaneously. He hauled himself over the edge of the mountain, cursing. His route had run out and he started climbing up low 5th class rock –climbing himself into trouble. He reports using the pick of his axe to knock away rock to make a few handholds so he could haul himself up a 10’ wall. I was worried: what about Rishi? Phil looked confused, until I told him Rishi was behind him. This started a fit of everyone yelling off the top of the mountain. If he heard us, we didn’t hear him. It took a long 30 minutes before he emerged from the easy scramble route. After regrouping, we set out to reach the main summit. There are several options available to scramble down to the col. I don’t recommend taking my route, there are easier ones. I found myself walking on the tops of dense, stunted fir, and balancing against crimpy rock for support. From the col (`1600) we followed a series of easy to navigate ramps up to the broad summit (~1759 m). We lingered a time, eating lunch, chatting, and enjoying the view. Conversation drifted to the difficulty of the route. Fortunately, those that were not comfortable, pushed themselves enough to overcome the challenges and revel on the summit. It was a great day, but more adventure awaited: we a better, more direct route back to the car. At the col below Mount Palmerston we walked west, down the side of the mountain. A festival of plunge stepping down the open terrain and perfect snow, allowed us to descend nearly 500 metres in 20 minutes. As we descended below 1300 metres the route presented problems. We navigated to the north side of a flowing watercourse, where the terrain changed. The canopy of larger trees disappeared and the open terrain gave way to dense growth of blueberry, and other alpine shrubs (B2). 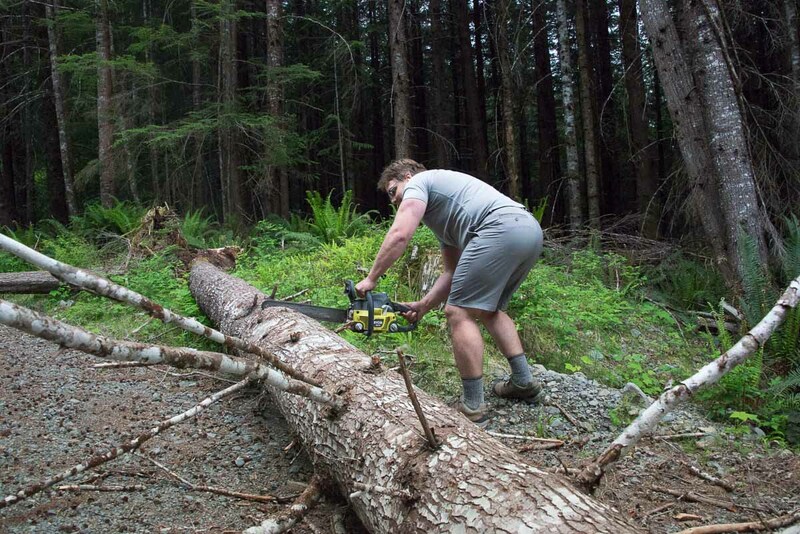 Compared to the open terrain of the old growth, it was taxing. Memories of High Rigger Mountain came flooding back. In the end Phil led us down a few short steps and gullies to easy walking below. It is a much easier route than what we used coming up. We emerged from the forest at the top of the logging slash, about 800 metres along the same contour line from where we entered on our route up. Out of the forest the sun sucked the moisture from my body. An intense thirst overcame me as I descended onto of the bleached-white bones of the dead forest that lay at my feet. We arrived back at the vehicles and on our way home by 5:30, well-before sunset. It was a great day in the mountains, though a bit tougher than we anticipated. The route we researched worked, but it was much more challenging than we expected. Our success was thanks to good route planning, excellent route finding, and a little luck. 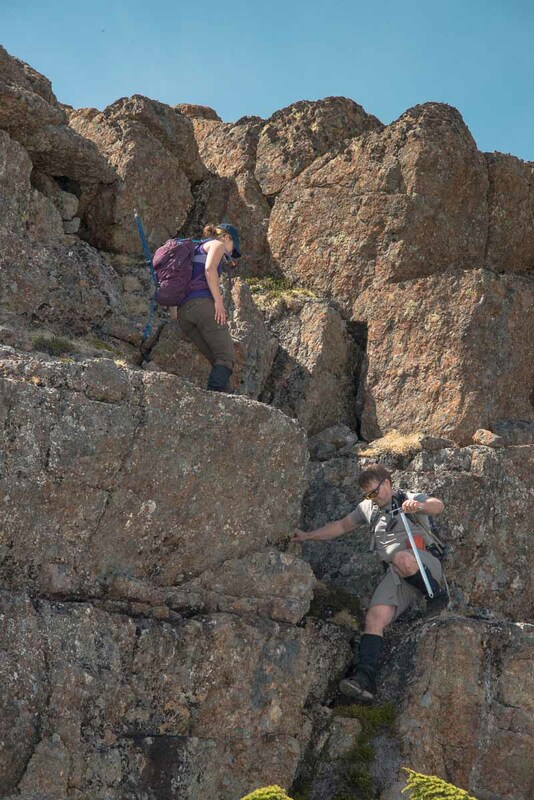 When I visit Mount Palmerston again, I will use a route similar to the route we came down. It’s more direct, easier to avoid the big bluffly section, and still provides access to the ridge. I will likely start farther to the east, at the dead-end of the logging spur where the mature forest touches the road. I can’t say for sure, but examining the topo gives me hope that it may avoid the long bluffly ridge that seems to extend between the route we followed up and the one we came down.